A denture adhesive is used to hold false teeth in place. They are effective in fixing not only full dentures but partial dentures as well. The best denture adhesives come in powders, creams, and cushions, and work to create a seal between the gums and dentures. Once dentures are held securely in place eating, talking and smiling can continue without mishaps that would otherwise make these activities difficult. Dentures without adhesives to hold them can shift and this will not only affect comfort for the wearer, it can be embarrassing. Enjoying food, drink, and conversation is hampered when false teeth shift, drop or fall out without warning. Denture adhesives prevent this from happening. As mentioned, denture adhesives come in 3 main types – creams, cushions, and powders. This article only talks about all 3 adhesive options. For a separate in-depth look at the strongest denture adhesive powders, click here, or for denture cushions, click here. 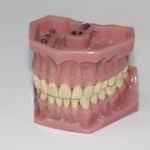 How Do False Teeth Stay In Place? 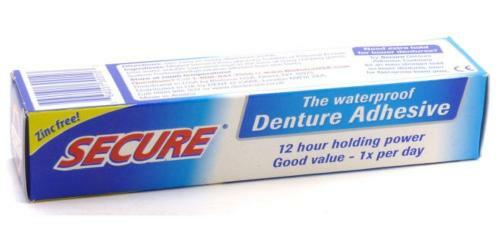 Denture adhesive is used to securely keep dentures in place. If your false teeth are a little bit loose or you are not confident that they will stay put, using a denture adhesive will help. A denture adhesive forms a layer between your gums and dentures preventing them from slipping. You simply apply the adhesive, which comes in various forms, to the underside of the denture plate where it would come in contact with your gums. Adhesives are available as a paste, gel, powder or pad. You may need to try different types to find the one that works best for you. 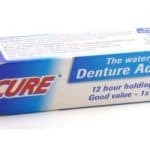 Is It Safe To Use Denture Adhesive? Denture adhesives are a safe and easy solution to keeping false teeth firmly held in place. However, they are specifically designed for use on new and proper fitting dentures. 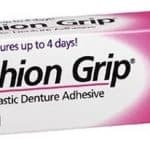 Using denture adhesives on old or poorly fitting false teeth can irritate gums and soft tissue. Also, using a denture adhesive in moderation is safe. You should not have to reapply adhesive again during the day. If you require several applications daily this means the dentures are either in need of relining to improve their fit or that they should be replaced. Health risks have been identified with denture adhesives that contain zinc. The level of risk increases in relation to the long-term length of use and amount of adhesive used with each application. The concern comes from a potential of developing high zinc levels in the body. The side effects that have been identified in relation to long-term or excessive use of zinc-based denture adhesives are classified as neurological in nature. The symptoms include difficulty walking, tingling or weakness in arms and legs, numbness or blood disorders. In order to avoid these side effects, always opt for adhesives for your false teeth that are zinc free. Lower dentures require more attention than uppers as they fit differently than one another. This is because lowers can be dislodged easily by movements of your lips, tongue and cheek muscles. It may take some time to train yourself to not accidentally slide lowers out of place. Plus, the lower jaw recedes faster on average than the upper jaw. This means that over time your lowers will have a smaller ridge to support them. With this kind of shrinking activity, food particles can get trapped under the dentures resulting in irritations of the gum and soft tissue. That being said, the adhesives mentioned in our post below are the strongest denture adhesives on the market and should do a good job for upper or lower dentures. 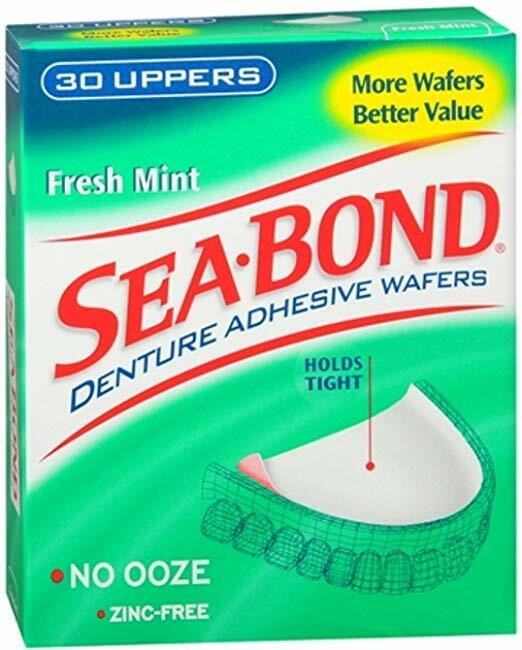 One popular form of denture adhesives is a cream adhesive. This product is applied as an even layer on the part of the denture that will rest directly on the gum line. The cream creates a bond once the dentures are gently pressed into place. The bond holds the dentures in place. Adhesive creams use a form of suction to keep dentures seated. The seal may break during the day if food particles get caught underneath the dentures or if the dentures shift uncontrollably. Adhesive creams are intended for use only during the day and should be rinsed off at night. 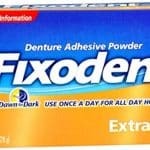 How Do You Use Denture Adhesive Cream? Dentures should be cleaned before applying any kind of adhesive. If you are using a dental cream adhesive, be sure to dry your false teeth prior to applying the cream. This will ensure a tight, solid grip without slipping. Begin by applying three or four dabs of the denture bonding cream to the false teeth on the side that will rest against your mouth. Then push the denture gently in place and hold it there for a moment. If some of the cream appears to ooze out, you will know you have used too much. If there is not any oozing, bite down on your dentures for a few seconds. This allows them to properly seat in place and gives the cream a chance to create a solid seal. If you feel your dentures moving around during the day, remove them and add a little more cream. With practice, you will be able to determine the right amount of cream to use. At the end of the day, you should remove your dentures. Gently rock them loose from the adhesive and wash them thoroughly with a denture cleanser. Do not use a regular toothbrush. Allow them to either soak overnight in a solution or dry and sit in a tray for the evening. There is a simple method for removing denture adhesive that remains stuck to your gums after you’ve removed your false teeth. The first thing you do is rinse your mouth with warm water. Use a soft-bristled toothbrush as well to loosen the adhesive and rinse again. Repeat if needed. To ensure you have removed the entire denture adhesive, brush your gums with toothpaste on a soft-bristled toothbrush. Be sure to be gentle with your gums but brush thoroughly to get any residue that may not have been dislodged by rinsing. This should remove the adhesive. There are several different kinds of denture cream brands available in today’s marketplace. They all do virtually the same thing; create a fast and secure bond to hold full or partial dentures in place. Personal preference will play into choosing the best one for your specific needs. Featuring a strong, all day hold, this product comes in a handy little tube that has an easy-to-hold grip and an ooze control tip. Made with a zinc-free formula, the manufacturer states that this item is free of artificial flavoring nor does it use artificial colors. 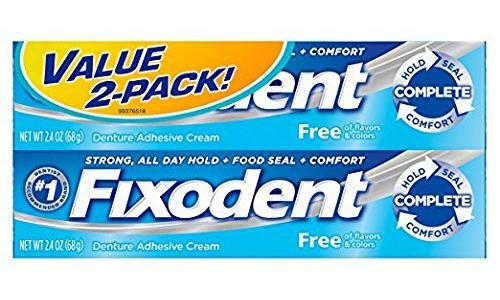 The selling feature here is that this cream is promoted to seal out “up to 74-percent more food particles” and is recommended for use with dentures that properly fit. This package comes with a total of four tubes in a set making for an affordable bulk purchase. 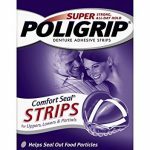 This product is promoted as the #1 Dentist recommended denture adhesive brand and includes a satisfaction guarantee. The strong, all-day hold comes from a seal that keeps food from getting caught between gums and false teeth. They also do not use artificial flavors or colors. One interesting thing to note is that this product is promoted as being able to “help prevent gum soreness” allowing for a comfortable fit. The company recommends using this cream on full or partial dentures. The packaging is a twin pack of 2.4-ounce size tubes of adhesive. This product is ADA (American Dental Association) approved and uses a zinc-free formula. 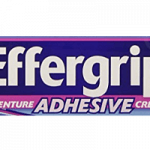 Promoted as being an extra strong adhesive that produces a powerful grip, you are assured of a long-lasting seal that will be comfortable. This is one of the best denture adhesive cream products in the marketplace. 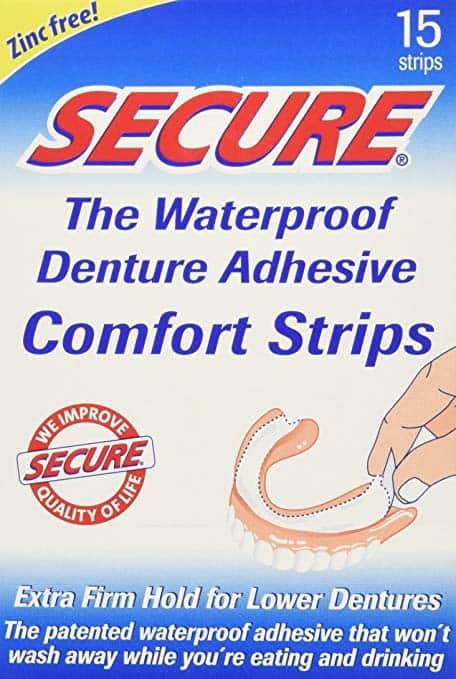 It is interesting to note that the manufacturer suggests for best results application should include three short strips of adhesive on the dentures. The tube comes with a nozzle for easy application. There is also a cap to prevent drying. The package is a single 2.5-ounce tube. Using a non-water-soluble formula, the Secure denture adhesive product creates a long-lasting seal that cannot be affected by liquids, including saliva. The manufacturer says that this property makes this adhesive a healthy and safe one to use on a regular basis. The formula will also not alter the flavor of the things you eat or drink. This secure full or partial denture adhesive cream is easy to use and is promoted as one that only needs to be applied once per day for a long-lasting seal. The seal is complete which holds false teeth securely and does not allow food particles to lodge. This package includes a single 1.4-ounce tube. You could call this a super denture grip. That’s because a single application will hold false teeth for up to four days. That includes daily cleaning, brushing and soaking as you should remove your dentures before going to bed. But with Thermoplast, the adhesive stays on the dentures and will reseal them to your gums without reapplying the adhesive for up to four days. That’s because it won’t wash off in water. As awesome as this product sounds, the manufacturer discontinued production in 2014. However, you can still find some quantities online for the incredible price of about $240 a package. Supply is limited so expect this item to be gone soon. 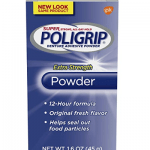 Another popular form of strong denture adhesive comes in a powder. It works in much the same way as an adhesive cream in that a seal is created between the gums and false teeth. The suction of the seal works to hold the dentures in place for the duration of the day. To use a powder adhesive you must first clean your dentures then wet them. While they are still wet, apply the powder in a thin strip along where the dentures will rest on your gums. Shake off any loose powder and insert the false teeth holding the plate in place for a few moments. This is to allow the powder to soak up the water and attach to your gum much in the same way adhesive cream does. If powder comes off the dentures while in your mouth, you have applied too much. There is no need to apply denture adhesive powder more than once per day. 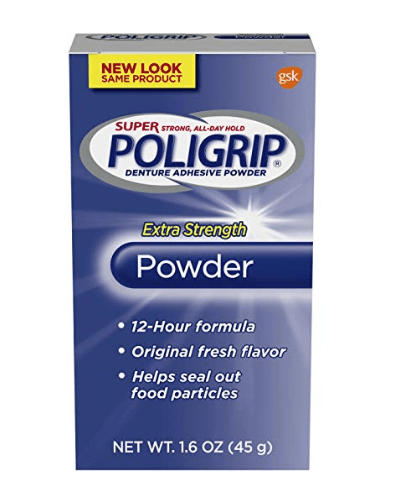 Poligrip promotes this product as offering all-day hold for denture wearers who would prefer an alternative to adhesive creams. The powder is convenient and easy to apply with a light sprinkle straight out of the box it comes in. The product has no artificial coloring and is made with a zinc-free formula. 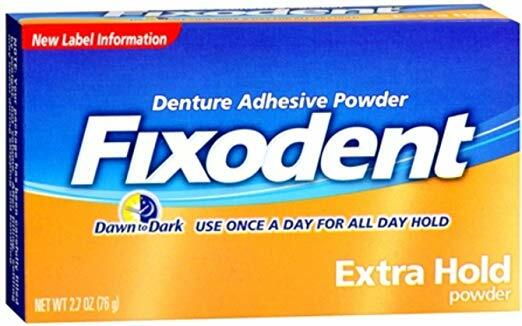 This product is promoted as the Number One dentist recommended denture adhesive brand so you know it has some significance. The product itself provides an all-day hold which the manufacturer backs with a money-back/satisfaction guarantee. The powder is easy to apply and it provides a strong, thin and airtight seal. It is also recommended for use with full and partial denture plates. 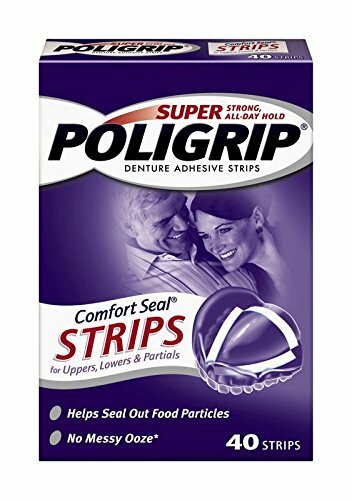 The American Dental Association provides an endorsement of this product which uses a scientifically formulated powder to hold dentures in place firmly and comfortably. 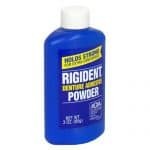 The manufacturer states that clinical tests have shown that Rigident actually strengthens and increases the hold it has on dentures when used. 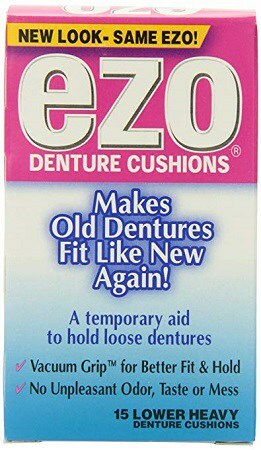 Plus, if you require a temporary measure to increase the retention of your dentures, this product is acceptable. However, you should still see your dentist to have your dentures relined or replaced to avoid prolonged use of this product with dentures that are no longer properly fitted. 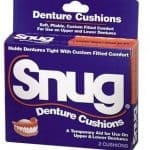 Another form of denture adhesive is a cushion or pad format. They are precisely as the term indicates, a small cotton cushion only these are impregnated with wax. They are easy to use and remove but are intended for just temporary use until dentures can be relined or replaced. The cushion is placed on the inner surface of the base of the denture along the location where the plate will rest against the gum line. The denture is then placed inside the mouth and gently pressed into place in order to create a seal between gum and denture. As denture cushions are designed to be a temporary solution for wearers who are losing bone density, there is another alternative. Gum shrinkage can be addressed with a denture liner. It is a flexible resin product that ‘re-fits’ dentures. Click here to learn more about them. 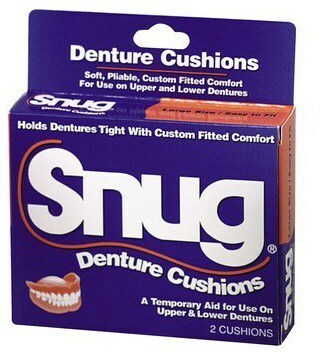 These cushions are designed for use with either upper or lower dentures and create the natural vacuum seal that will hold false teeth in place. In fact, the manufacturer has called the entire process VACUUM GRIP. These cushions are made of a combination of cotton flannel, paraffin wax plus corn oil. They leave behind no bad taste or smells and will hold for up to a full day. After you are done with them, just peel them off and toss into the trash. Promoted by the manufacturer as providing soft, pliable, custom fit comfort, these cushions are effective for use on both uppers and lowers. They are meant to be used as a temporary measure until you can schedule an appointment for a dental visit for a professional reline or replacement of the dentures. Featuring all-day hold, these strips are easy to apply as they feature a mess-free format. Each cushion is pre-measured and individually and hygienically wrapped. Because they are pre-cut, they already have the correct amount of adhesive applied. They also have no artificial coloring and no artificial flavoring. 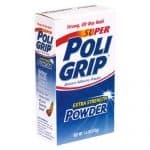 Poligrip is also one of the few brands to clearly indicate that their adhesive cushions have a zinc-free formula. 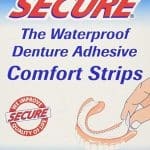 This particular brand of adhesive strips is specifically promoted by the manufacturer as being intended for use on lower dentures. The adhesive formula used in the cushions is patented and will not wash away when used during meals or consuming liquids. The company stresses that using this product will “improve quality of life.” The package here contains a total of 15 strips. 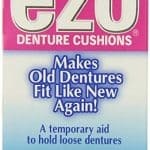 Denture cushions, strips, seals, and wafers. They are all different terms for pretty much the same item. 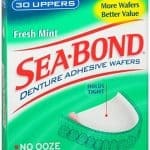 Sea-Bond calls them wafers but they are cushions nonetheless. They last all day and require no reapplying. Promoted as providing an all-day, comfortable hold, these wafers come in two different varieties. They have them in uppers as well as lowers. 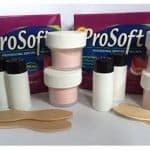 The pre-measured adhesive is easy to use and has a no-mess formula. Plus, the formula is also zinc-free. 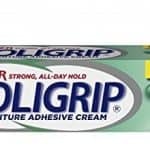 Which Is The Best Adhesive For False Teeth? The strongest denture adhesive options mentioned here are intended to hold dentures firmly in place. 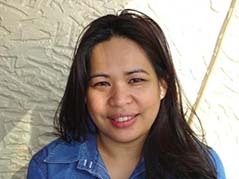 When they are not held correctly, they may shift or fall out. When this happens it can often be a source of embarrassment when it takes place at the wrong time. Denture adhesives should keep this from happening. As only you will know what works best for you, it is always important to try different products to see how they perform. The same goes when choosing the best adhesive for dentures. You may not know if you prefer to use creams over powders, so try a few different options to find your preference. These choices on this list are, in our opinion, the best dental adhesive options available. What’s The Best Way To Clean Dentures? 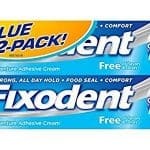 I believe that OlivaFix would top or come close to the top of the list of recommended denture creams. It is Olive Oil based. A great alternative to the good products already on the market. It is not yet as well known. It changed my lifestyle. Anyone wanting to check out more info on OlivaFix, feel free to check this out.